Anyone else craving something sweet today? 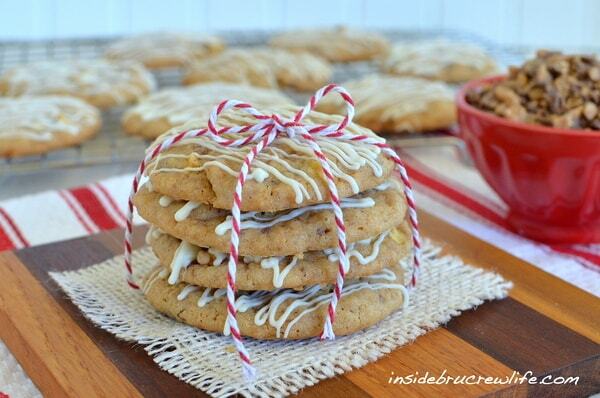 I have some Toffee Apple Pie Cookies with your name written all over them. Come on over and we will sit and chit chat while we munch on a batch of homemade cookies. 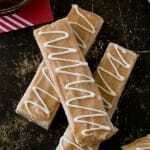 These are the perfect fall treat to enjoy with a homemade Salted Caramel Mocha Latte. 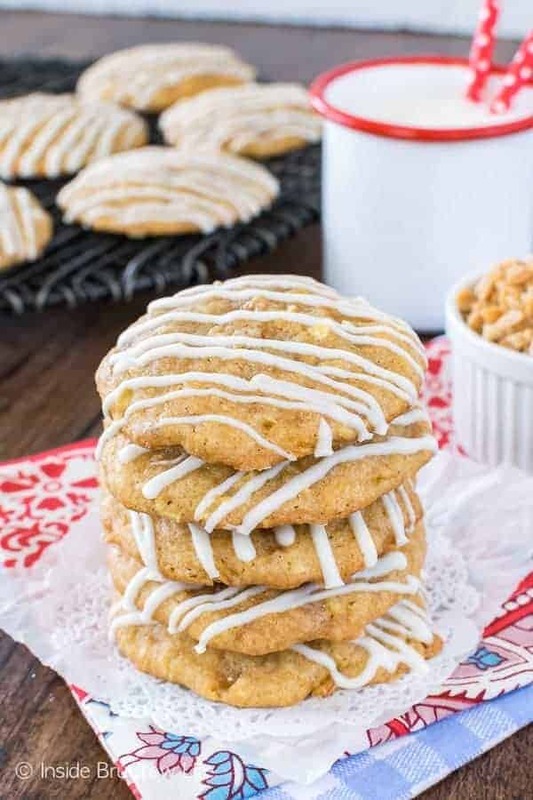 Soft bites of apple, the little taste of graham cracker, and the crunch of toffee all in one little sweet cookie will have you reaching for a second and a third apple cookie in a hurry. And because they have fresh apples in them, I consider these a perfect breakfast food too. Don’t you think they kind of look like a muffin top? 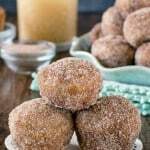 Of course, thinking about muffins makes me want to make another batch of these Cinnamon Sugar Apple Donut Holes too. Do you want to know what I liked best about these apple cookies? Well, besides the fact that I added candy to them and white chocolate drizzles to the top. These cookies stayed soft for almost an entire week because of the apple bits. I kept them in a very tightly sealed container, and 5 days later they tasted just as good as the day I baked them. I have a feeling that they would have stayed soft for a week or more, but since they didn’t last that long I’ll never know. Although, I’m wishing I had thrown them in the freezer right away for lunches because I couldn’t seem to stop eating them. Fingers crossed that one of these days I will crave things like this Strawberry Orange Spinach Salad instead of cookies. Thank goodness for cooler weather coming and baggy sweatshirts, so I can hide my cookie chub. Am I right? Beat the butter and sugar until fluffy. Add the egg and vanilla and beat it again. Stir together all the dry ingredients and slowly add them the butter mixture. 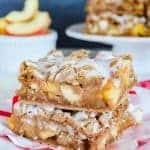 Use a food processor to shred some apple slices. Stir the shredded apples and toffee bits gently into the cookie dough. Refrigerate the dough for at least 30 minutes, so that the cookies do not spread too much when baking. Using a cookie scoop, divide the dough into 24 dough balls. Place on a cookie sheet and bake for 12 minutes. I like to use a Silpat on my baking sheet to keep them from spreading too much. Once the cookies are cool, drizzle the tops with some melted chocolate. You could also sprinkle some graham cracker crumbs or toffee bits on top, if you like. 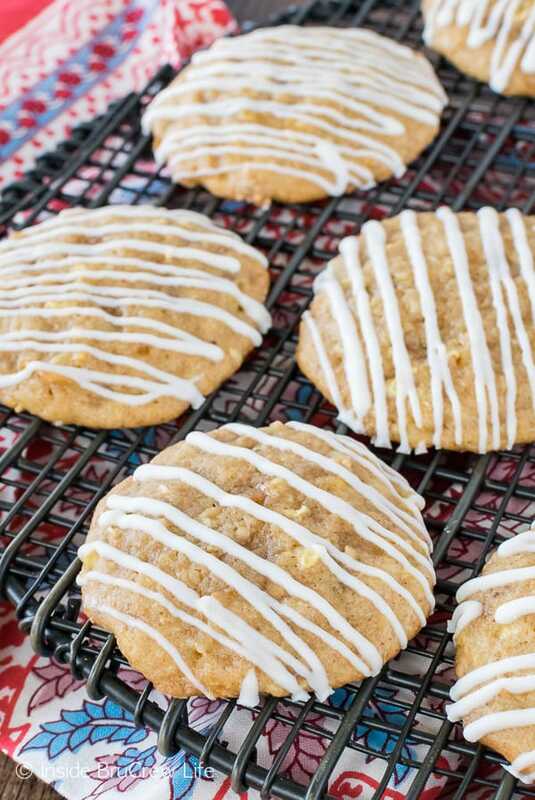 Candy bits and white chocolate add a sweet twist to these Toffee Apple Pie Cookies. These amazing cookies stay soft for days. In a mixing bowl, cream the sugars and butter until fluffy. Add egg and vanilla. In another bowl, stir together the flour, graham crumbs, baking powder, salt, and spices. Add to the butter mixture slowly and beat until just combined. Stir in the apple and toffee bits by hand. Refrigerate the dough for 30 minutes. Scoop the dough into 24 even dough balls. Place on a baking sheet and bake for 12 minutes. Cool on pan for 2-3 minutes and then move the cookies to a sheet of parchment to cool completely. Melt the white chocolate melts according to the package directions. Stir until melted and creamy. Spoon into a plastic bag and cut the tip off. Drizzle over the tops of the cooled cookies. Let set. Store in a tightly sealed container. Makes 24 cookies. 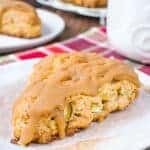 *The recipe and post for these Toffee Apple Pie Cookies was originally posted on September 17, 2012. The post and pictures have been updated and republished on October 1, 2018. Hey girl! These look so yummy. Thanks for stopping by my blog and leaving such sweet comments. I always thought that you took the best photos of your food. They could be in magazines. LOL! Hope you are doing well. Hugs! Thanks you are the sweetest:-) Maybe a magazine one day…my fingers are crossed!!! I love that you used 1/2 c. graham cracker crumbs in them AND that they stayed soft a week later! A nice dose of brown sugar I find does that and these look….awesome! I was so excited that they stayed soft for that long. And the graham cracker crumbs was just perfect!!! 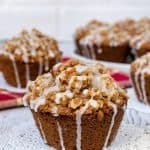 I would love 1 (or 4) of these for breakfast – they look perfectly amazing!! These are gorgeous Jocelyn. If you have a cookbook can you give me a signed copy 🙂 You’re on your way! YUM. Oooh, those are just full of yummy ingredients. They must be super yummy! Toffee! And apples! In a cookie! Do the excessive exclamation points tell you how awesome these look?!?!!! These even look super soft! LOVE! And I agree with Aimee–I’d SO buy one of your cookbooks! I looooove that you used graham cracker crumbs to these cookies. Not only does that remind me of apple pie (!!) but with that added toffee twist and I’m officially drooling 🙂 and that’s awesome that they stay soft a week later, though I don’t think they’d ever make it that long here! Loving this Apple-themed week, girlies! Looks great! How fun that you’re all doing this together! What a great cookie! I’m SO in love with these! yum! I’ve been waiting for you to post these Jocelyn! LOVE the graham crackers hiding in the dough. 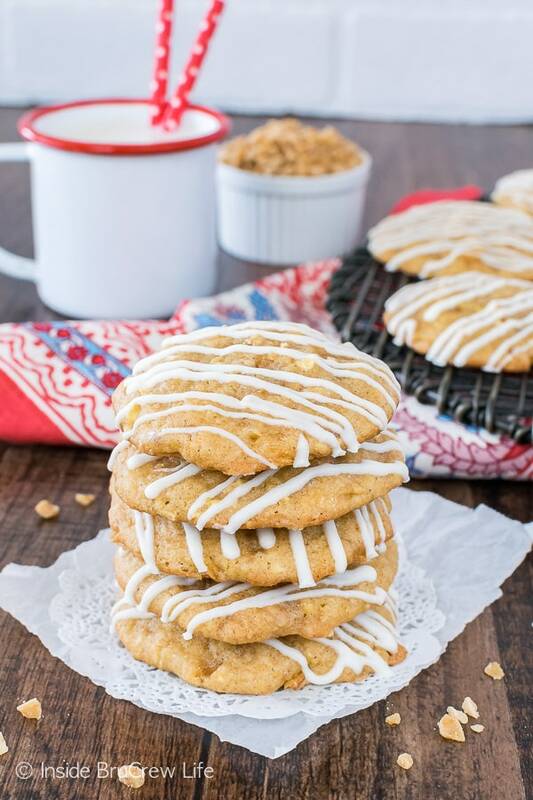 Toffee and apples are a combination I have yet to try in a cookie! The graham cracker crumbs in the dough is the perfect touch…totally like eating pie! You must try toffee and apple together…best cookie ever!!! You can’t trick me. That’s not breakfast. YUM!! I love anything with toffee in the recipe. Can’t wait to try these. I will be pinning these. Thanks!! You’re so sweet to wrap that stack up for me! I might just have to make these for Grace’s bake sale this week! Toffee, apples, white chocolate, graham crackers, what’s not to love about these. You know I had to Pin them! The apple in it helps give the cookie such a soft texture. You should definitely try it sometime. Can I use Applesauce instead of real Apples? I know that you can substitute 1/4 c. applesauce for 1 egg. You could do that in this recipe and then just leave out the apple chunks too. I wouldn’t add any more applesauce because it will affect the texture of the cookies. I’d like to invite you to check out my blog- Earning-My-Cape, and to link up to my Super Link Party on Wednesdays! oh man, Jocelyn… these cookies look great! I’d love it if you would link this (and a couple other recipes if you’d like) up to Wonderful Food Wednesday at: http://www.athometake2.com. I hope you can stop by. Loving the photography, so colorful and vivid! These look so good. I have a link party on Wednesdays, and I would love it if you would link this and any other posts. It is called Wednesdays Adorned From Above Link Party. It runs from Wednesday to Sundays. I made these this afternoon after finding the recipe on Pinterest. They are yummy…even without the white chocolate frosting! Mine came out kinda flat and not sure why. Thanks for the recipe that really tastes like fall! I am so glad to hear that you made them and love the taste. You could refrigerate the dough for 30 minutes next time…that will help them not spread so much. These look awesome. I was really drawn to them when I saw them at Tidy mom’s link up party. They sound delicious too. I love apples in anything. Thank you:-) Apples in anything just gives such a great texture and taste!! I made these this weekend just to try them out…amazing! I suggest keeping them in the oven for maybe 15 minutes tops! I did 12 and they were a bit gooey (still delish!) I will definitely be making them for thanksgiving and bringing them over to my boyfriend’s family’s house! (That’s how you know they’re good…they are good enough to show off to the boyfriends family LOL) Love them! Thank you for the recipe!! I found this recipe on Pinterest and made a double batch for a cookie exchange I attended yesterday. Absolutely delicious and highly addictive! Thanks so much for sharing – I will definitely be making these again. Do you need to peel the apple first? You can do either. It is up to you what you want. I usually leave the peel on and shred the apples in a small food processor. You say 5 days for the cookies to stay soft. After that are they still good when they aren’t so soft? I’m sorry they were too sweet for you. You could leave off the extra drizzle of white chocolate to save some sugar. I just like to make them look pretty with it. The cookies would be fine without it! This recipe is AMAZING!! I have made it multiple times, it is perfect to bring to friend’s/family’s houses over the holidays. It is always such a big hit! Many people have raved about them and asked for the recipe. If you don’t know what to bring over for thanksgiving, BRING THESE!! 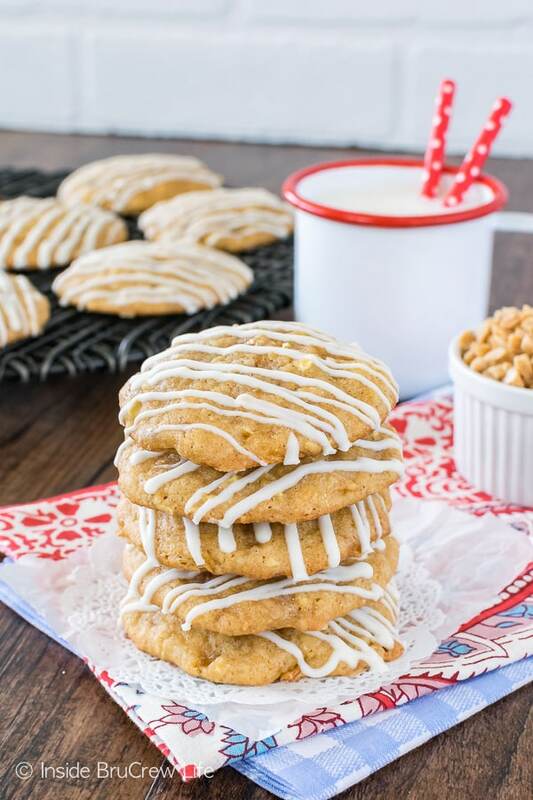 I am so glad to hear how much you like this cookie recipe!!! It is one of my favorite cookies too!!! I have made these and boy oh boy! They are absolutely delicious! Yes, they do stay soft and I had many many compliments for them. I also have a co worker BEGGING for me to make them again lol. They are so pretty after you drizzle them with the white chocolate. I found this site because we have apple trees and this year was a very good year for apples! There were quite a few recipes I collected but this one is hands down THE BEST!!!! Thank you!